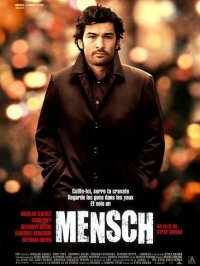 Mensch is Yiddish for "good person", in fact I think there's another movie coming out soon with a similarly titled theme, but anyways, I've been keeping an eye on this one for a while as it's supposed to fit into the category of "noir" even though I don't see much in this short teaser. Sam Hazak belongs to a family of Jewish shopkeepers in the Faubourg Montmartre area of Paris. Refusing to work in the family business, Sam becomes a notorious safebreaker. But despite his talent, he finds life difficult. He pretends to his family that he is a property developer, but nobody is fooled, least of all his grandfather, an old-school "mensch". Sam is asked by one of the areaâ€™s old bosses to take part in a robbery at a diamond merchantâ€™s. The break-in could be very profitable and enable Sam to retire before his nine-year-old son starts asking too many questions about his father.